Major General Reuben D. Jones listens as a Friday Forum participant asks him a question. If you haven’t visited Friday Forum at Koinonia Coffee House, then it is definitely an activity that you should add to your to do list. The forum, sponsored by the Jackson Chamber of Commerce, features a weekly speaker and a discussion segment that is usually very engaging. You’ll learn a lot about the many things going on in Jackson and you’ll be able to experience West Jackson’s own Koinonia Coffee House–one of Jackson’s exquisite coffee spots. 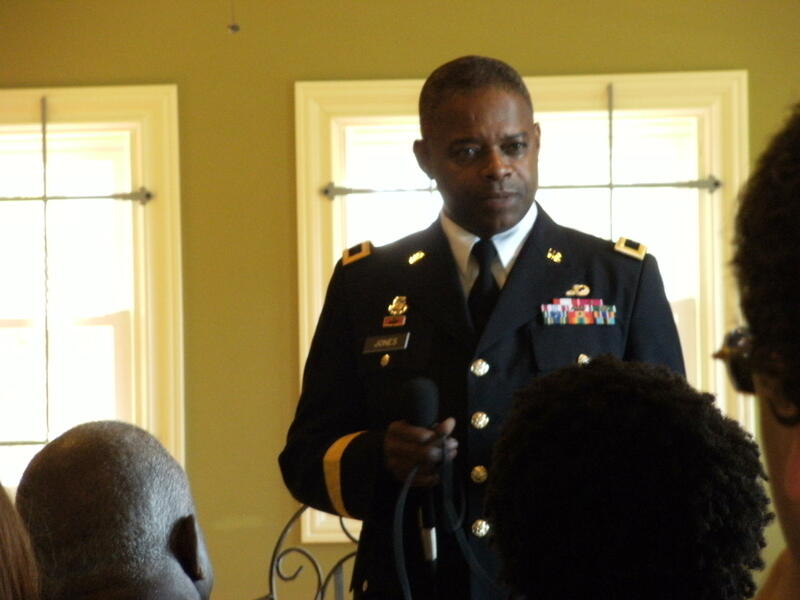 This past Friday, Friday Forum participants were able to hear the testimony of Major General Reuben D. Jones. MG Jones is a two-star general who grew up in West Jackson near the corner of Dalton Street and Banks Street. As a youngster, MG Jones met the Cooleys–a family that lived on Buena Vista Street. When Dr. Bill Cooley was called to duty to serve as a U.S. soldier in the Vietnam War, Mrs. Cooley hired the young MG Jones to cut the Cooleys’ lawn while Dr. Cooley was at war. It was during this time that Jones learned about trust and responsibility. It was also during this time that Jones and the Cooley family developed a friendship that would last for decades. As time passed, Jones graduated from Provine High School (’74) and later, Jackson State University (’78). MG Jones’s education also includes Master’s Degrees from the U.S. Army War College and Central Michigan University. Now, Jones is the Commanding General of the Family and Morale, Welfare and Recreation Command. This Command is responsible for 162 programs that aim to uphold the FMWRC’s philosophy which states that “soldiers are entitled to the same quality of life as is afforded the society they are pledged to defend. Keeping an Army ready to fight and win takes more than hard work and training. Soldiers need a balance of work and play.” FMWRC programs range from Tops in Blue (a soldier talent show) to an Exceptional Family Member Program that seeks to assist the families of soldiers who have members with special needs. Major General Jones is confident in the U.S. military and proud of our U.S. soldiers. In his 32 years of service, Jones acknowledges that the United States provides all that is necessary for our soldiers to prevail in times of war. “We provide them the cutting edge of thought…technology…and whatever it takes to make them successful,” he told Friday Forum participants. During the discussion, Jones describes a piece of artwork that hangs in his office. The art features a blazing sun in the background that encompasses the silhouette of a soldier. Jones explains that this sihouette does not reveal whether the soldier is male or female, black or white, young or old…but it does serve as reminder for him that that soldier, and every soldier, has a list of needs that must be met and a family that must be protected. Jones encouraged forum participants to make sure that they thanked our soldiers for their service; but not to wait until veterans day to do so. Well said, and we thank you for your service Major General Jones. West Jackson, Jackson, Mississippi, and our nation are all very proud.